LED Curve Tracer: First Light! The Y axis (current) is logarithmic, so the traces should be straight lines. They’re loosely color-coded by LED color (black trace = white LED) and that blue trace looks mildly suspicious even to me. You’d want a better graphing program than OpenOffice Calc, but it’s OK for a quick look. 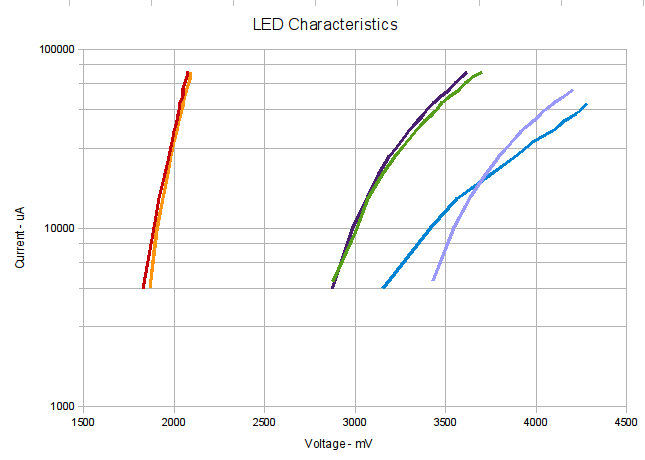 Note that the rated current for 5 mm LEDs is generally 20 mA, so 75 mA really puts the screws to them. That notwithstanding, the curve tracer machinery seems to work well enough. The numeric values in the dataset have way more precision than the measurements have either accuracy or resolution. If we could put floats in those printf() format strings, then I’d be more inclined to prettify the results. INOM is the nominal current in mA (and also the loop counter) and ILED is the measured LED current in μA. All the voltages are in mV, with a resolution of 5 V/1024 steps = 5 mV.